The Illinois Athletic Trainers Association (IATA), a subsidiary of the National Athletic Trainers’ Association and the Great Lakes Athletic Trainers Association, is a resource to serve current members, offering them links to continuing education credits as well as networking opportunities. 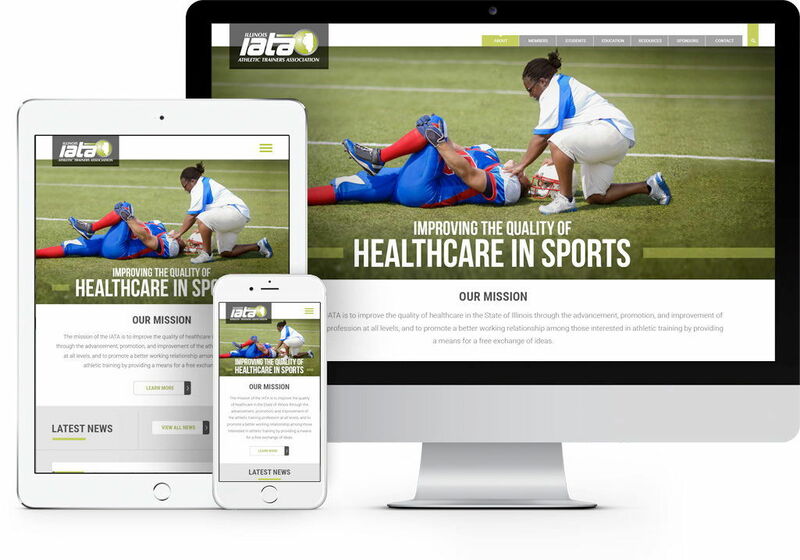 Their site is a wealth of information for athletic trainers in Illinois, but their site wasn’t as responsive as they needed it to be. IATA came to us requesting an update that would streamline and modernize their site while offering their members the information they need to pursue their profession. While the site was functional, it wasn’t as responsive as it needed to be. The navigation wasn’t organized well, with most of the features that would be useful to members buried under the “About” tab. The site was due for an organizational overhaul. The organization is funded in part by sponsors, and they wanted the option to swap out the logos should there be a change in the roster. Additionally, the organization is staffed entirely by volunteers; this means that there’s frequent turnover in the staff. How could we create a site that would serve the members of the IATA and be simple enough for the ever-changing staff to use? Keeping in mind their volunteer status, we thought that the IATA would be an excellent candidate for our support services; the client will pay a monthly fee that encompasses their server, their CMS license, and, most importantly, 24/7 support from our staff. If a new person should come aboard, we could train them on the CMS so they’d be completely comfortable making changes to the website. These changes could include the sponsors, ensuring that the site is always thanking the sponsors who are supporting them. The new IATA website is completely responsive, so it can be viewed on mobile devices, tablets, desktops, and large displays, ensuring that their members can get access to the information they need anywhere, anytime. The navigation was reorganized to make it easier for their users to find everything they need in a timely fashion. In addition to the navigation bar across the top of the page, members can access current news and upcoming events directly from the homepage, ensuring that they won’t miss an important event if they don’t dig deep into the site. The Founding Partners and Presidential Partners are prominently featured at the bottom of the homepage, and they can be changed as necessary. If you click on the Sponsors page, the Platinum, Gold, Silver and Bronze Sponsors are featured as well.